A lose vacuum hose is a pretty common occurrence on the 3rd gen RX-7 and to get to most of them you'll have to remove the extension manifold. Pulling it off exposes a lot of stuff and makes a lot of other jobs much easier. You might want to consider doing the following while the intake extension manifold is off: Replace the vacuum hoses, spark plugs, plug wires, install an ignition amplifier (Crane Hi-6, etc. ), install a manual boost controller, hook up a wire to the trailing coil for a shift light, and have the extension manifold polished (looks very cool). Access to all these components is much easier with the manifold off. Start by removing the strut tower brace if you have one. Remove the air pipes that go from the air cleaner to the turbo inlets and the air pipe that runs from the turbos, past the alternator, to the intercooler. Remove the intake elbow pipe that attaches to the throttle body by removing its 4, 10mm chrome cap nuts, hose clamp and 1 vacuum hose. Remove the throttle body by: Remove the throttle cable by rotating the throttle and sliding the throttle cable end out sideways. 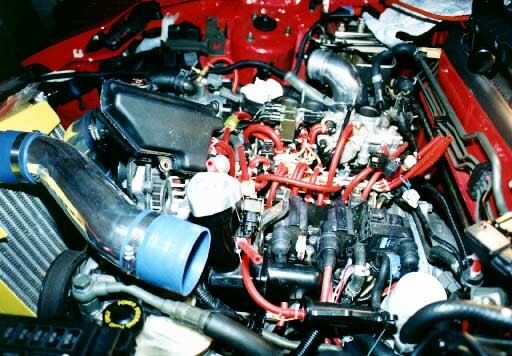 Remove the throttle bodys 4, 12mm cap nuts, the coolant hose from the firewall side, the coolant hose from the bottom of the throttle body, and 1 electrical connector on the firewall side. Now comes the fun part. There is a lot of stuff attached to the underside of the manifold and all of it needs to be disconnected before you can lift the manifold off. The extension manifold comes off by removing 5, 12 mm cap nuts, 2 bolts that hold down the solenoids under the manifolds front side, 1 bolt on the front left side (nearest the battery), 2 bolts that attach the engine lift loop at the right rear side (there are two ground wires attached to these bolts). I had to partially lift off the manifold to get at these 2 bolts, they were on tight and I had to get a ratchet wrench on them. There are also 3 electrical connectors that attach to the manifold. All of these connectors have a latch that when pushed-in allows the connector to slide off relatively easily. Dont force the connector without releasing the latch or youll break the connector. Lastly there are about 5 vacuum hoses connected to the manifold, one connected to the "Double Throttle Actuator" (on the rear of the manifold) and one PCV (Positive Crankcase Ventilator) line that runs from the oil filler neck to the PCV valve to the front underside of the manifold. Make sure the PCV valve allows air to flow to the manifold but not from the manifold. Try to remember where all this goes so you can reconnect it later. You may want to label the hoses, sketch them, or even take a picture of them before unplugging them. I had three problems after I got the manifold back on. I had a hose that connects to the manifold pull loose from the non-manifold end; I had two hoses that connect to the rear of the manifold crossed; and I had a pinched hose under the manifold. When you get the manifold on, take a good look under and around it to look for hose problems. Take a good look at the Vacuum Hose Diagram and verify hose placement too, then bolt down the manifold. Also, be careful not to swap the two electrical solenoid connectors on the front of the manifold, If you do you only get about 7 lbs. of boost from your second turbo. 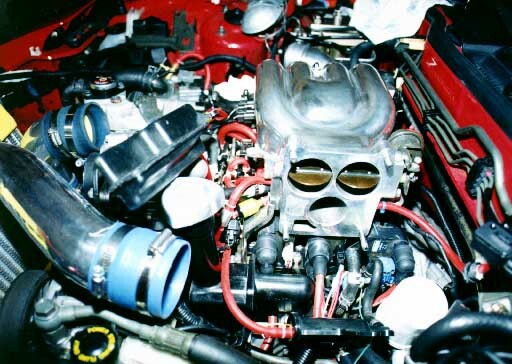 One of the most beneficial aspects of removing your extension manifold is that you will learn a lot about your engine compartment and have a much better understanding of how complex the twin sequential turbocharger control system really is. Ready to replace the vacuum hoses? See the Vacuum Hoses how-to.